This is an album that takes 'quirky' to a new level, certainly in the modern day, with its blend of blues, hillbilly, vaudeville, jazz, folk, klezmer ....... and so it goes on, with just about every American 'roots' music sub genre blended into a highly entertaining stew. They have been nominated for awards in both the 'folk' music and 'jazz' categories and yet even that wide diversity doesn't really sum them up. This album exhibits an often wild exuberance that can only be engendered by a group of people who love playing together and love the music they are playing. This is their third full length album and whilst I've yet to hear the first two I can't imagine listening to them will prove to be any hardship if they are anything like this extraordinary recording. They are a six piece band, based in Toronto, Canada and are made up of John David Williams on clarinet, harmonica and vocals, Kelsey McNulty, accordion, piano and vocals, Laura C Bates on violin, Justin Ruppel, washboard, bass drum, banjo and vocals, Karl Silveira on trombone and jaw harp and Rob Teehan on sousaphone. On this recording they are helped out by 'friends,' Adrian Gross on mandolin, Michael Eckert on dobro and last but far from least Lotus Wright (Sheesham, Lotus and Son) on cello banjo and vocals. On the face of it you can be forgiven for thinking the sheer numbers and diversity of instruments would make their sound dense and unwieldy. However there is little that is further from the truth, with a lovely 'lightness' to the sound and a beautiful flow to this fourteen track recording, most of which are instrumentals with only four including vocals. A degree in mathematics is probably not necessary for the reader to work out that each of the named vocalists takes one song each, a shame in many ways, because the performances are good, although conversely, with more vocals we would then be robbed of some tremendous instrumentals. Of the compositions, five are written by Williams, one each by McNulty, Ruppel and Teehan, a couple are 'trad' and there are several by other writers. 'Diversity' is very much the key to this tremendous collection and yet it is not an album that gives the listener an encyclopedic run through of the various strands within roots music. There is a lovely flow to the recording and the tracks blend beautifully with no track making a generic labeling easy. Whilst the aforementioned styles, and more, are all included these talented musicians have very much their own loose style that borrows from multiple sub genres, eventually ending up being their own uniquely idiosyncratic genre. The first track on the album Hindustan, gets things going with trombone, clarinet, violin and percussion, eventually joined by mandolin, dobro and accordion on an upbeat mid tempo instrumental that goes some way to preparing the listener for the diversity that is to follow. The first non-instrumental is Old Tracks with its lovely vocal courtesy of Kelsey McNulty on a song on which she is supported by mandolin, sousaphone, accordion, trombone, violin, clarinet and perhaps one or two I can't identify so you decide if there is a genre this fits into. It really is an excellent song though, creating an atmosphere that perhaps harks back to the first couple of decades of jazz and despite the variety of instrumentation the vocals are never overwhelmed. Wally On The Run is a complete change with its jaw harp intro soon joined by banjo, then fiddle with sousaphone, mandolin and harmonica eventually adding to the brew on an instrumental that perhaps has a hillbilly feel, at least for some of the time! On Take Your Fingers Off It the vocal is provided by Lotus Wright on a traditional song that echoes jazz from the early 1920s but definitely provides an update with clarinet, trombone, sousaphone, percussion and Lotus's raw evocative vocal. That is followed by the title track Cicada Ball with a fiddle and banjo intro that is soon joined by the 'brass section' on a meandering instrumental that changes tempo's at will and is at times evocative of those recordings made when jazz was in its infancy. In many ways this is a track that explores and plainly exhibits the incredible musical ability and arrangement dexterity of all concerned as does the very next instrumental Scrammy Jammy, although this one has an entirely different arrangement and structure, despite both come from the Williams pen. The tune is led by a lovely accordion sound on a composition that has incredibly varied tempos with the support of the clarinet, sousaphone and trombone and an arrangement that whilst using a similar instrumentation is actually 'chalk and cheese' with its predecessor. 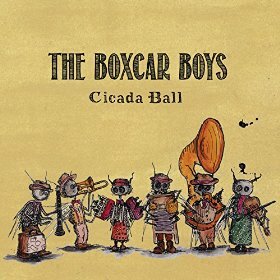 The Boxcar Boys is very much a collection of musicians brought together by people with myriad influences but with a similar musical vision in mind. That is one that borrows from those influences, most of which are very much rooted in the first couple of decades of recording, but ultimately doesn't copy any particular style, very much a case of rolling the dice and seeing how they fall, then developing on that. It should be fairly obvious to anyone that musicians with that attitude need to be overflowing with ideas and talent. Fortunately the Boxcar Boys have an abundance of both!